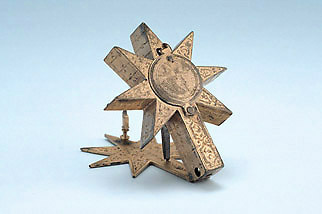 This dial has the unusual form of a seven-pointed star with a rectangular base. On one side is a compass mounted on pivots, so that it remains horizontal when the dial is in use and is covered by a moving brass plate engraved with a figure of a woman, which is also engraved on the other side of the dial. A similar star-shaped dial in the British Museum (Epact 90672) is signed 'H F' (perhaps Hans Felt) and dated 1550.